My Granny B told me, “Gratitude is your best attitude each day.” Her Granny B’isms (as I’ve come to call them) were her little pearls of wisdom imparted during the important work in her kitchen. I spent a great deal of time with my maternal grandparents during my formative years. Granny loved being in the kitchen and planned elaborate baking opportunities for us on Saturdays (in between watching Julia Child on PBS each week) as she told me stories and quietly dispensed her B’isms. Ironically (although never formally diagnosed), she was manic depressive. Before there were self-help books, talk shows, and the medications used today, she created her own form of self-help and hope. She believed strongly in her faith journey and in the power of gratitude as her personal prescription toward a deeper gratefulness for life. Celebrating daily gratitude became her habit, her attitude, and her unspoken effort. I know she struggled many days, but she always kept giving her personal best. Gratefulness was a powerful way to positively connect with those around her. And who doesn’t like being around a person who’s genuinely grateful? So today, think back over your formative years. 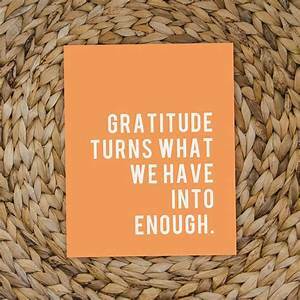 Who first demonstrated the power of gratefulness with an attitude of gratitude? If given the opportunity, what would you say to this person? In our complicated society, it is my sincerest hope we continue to seek and find an attitude of gratitude daily…and as always, gratefully choose to lead with love.